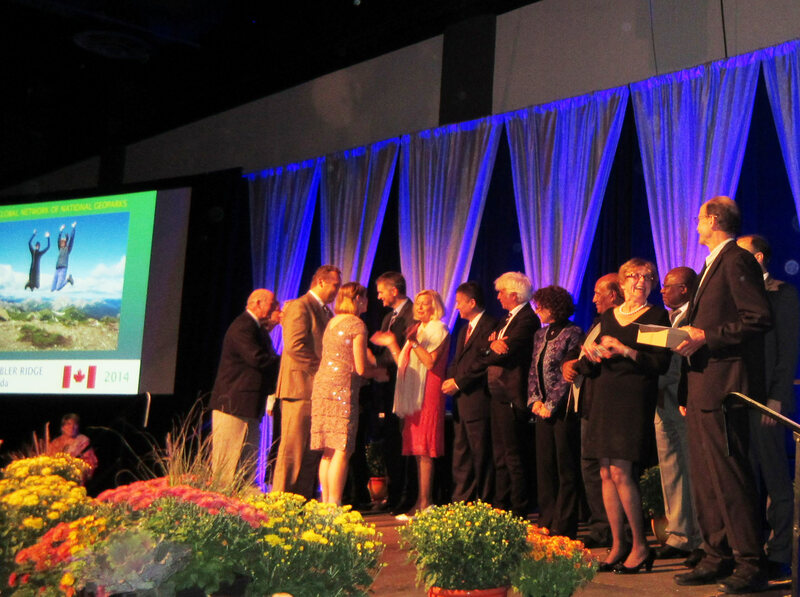 At the gala dinner at the conclusion of the sixth UNESCO International Conference for Global Geoparks on the evening of September 22nd, the Global Geoparks Network announced the designation of eleven new Global Geoparks. The conference was organized by the Stonehammer Global Geopark in Saint John, New Brunswick, and was attended by just under 500 delegates from 30 countries. The Tumbler Ridge Global Geopark was one of those that received this designation. It becomes the second Global Geopark in North America, and the first in the west. There are now 111 Global Geoparks worldwide, supported by UNESCO. The Tumbler Ridge Aspiring Geopark Society sent seven delegates to the conference, all of whom benefited immensely from the experience. This announcement ushers in a new phase of hard work, in order to do justice to the honour of this coveted designation. Huge thanks are due to the Tumbler Ridge Global Geopark committee and its scientific advisors whose dedication made this possible, the Peace River Regional District for their funding support, the District of Tumbler Ridge, the Canadian National Committee for Geoparks, and Stonehammer Global Geopark.